I kind of have a thing for roller coasters. Upside down, spinning in circles, and ridiculous drops… I love going to amusement parks just to ride the roller coasters. I’ll be honest. I’ve been on the same roller coaster for the past 5 months, and I think I’m getting ready to get off. I’ve been up, I’ve been down, and I think I was upside down for the better part of a few weeks. I haven’t lost my lunch, but I thought about it for awhile. However, I am a roller coaster junkie… and right now, I’m feeling that upward trend again. Yes, a 3-5 homestand is embarrassing, especially since we were playing 5 of those games against the Cubs and Brewers, who should have been a doormat waiting for the Cards happy cleats to run right over. But! Winning the last two games against the Giants and last night’s game against the Pirates in rather dominating fashion has me looking up at the sky again, wondering how far I’ll see the team climb this time. Is this the hill that pushes the team over the top? Am I being tricked again, raising my hopes and then watching them go down, down, down in a death spiral, then returning me to the start, forcing me to immediately get off and get back in the long line (unaffectionately called ‘winter’) until the Spring Training gates open and I can get back on for another go around? 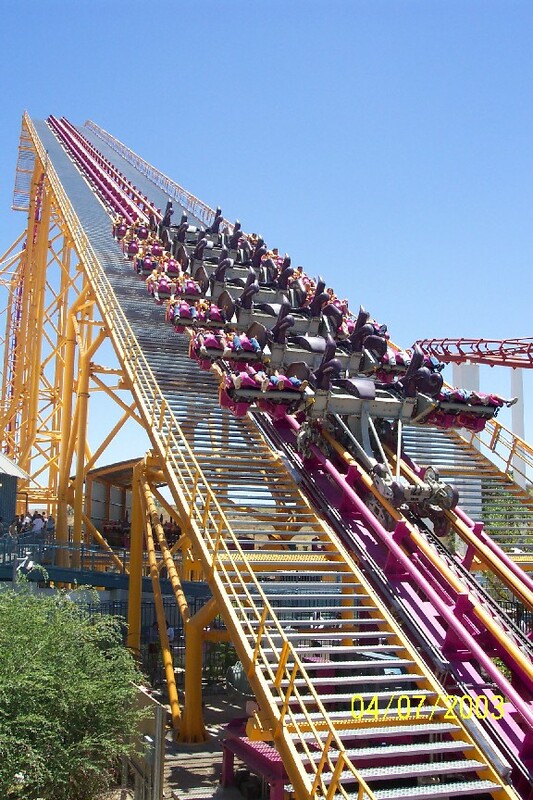 Another plummet would be sickening, even for this roller coaster fan. That doesn’t mean I’m giving up hope. Why? For that answer you have to go over to my post on i70baseball. I know, what a tease. 🙂 Game time is 6:05 again tonight. Don’t be like me last night and forget about that east coast start time! 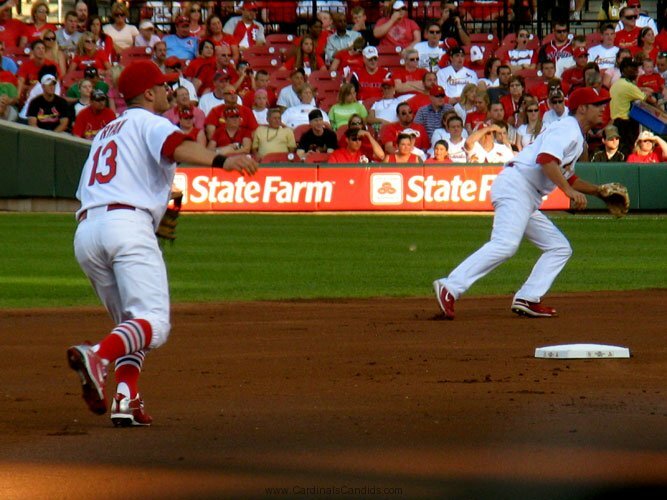 While the Cardinals 8-game winning streak was wonderful, the subsequent 3-game losing streak had me bummed. The team again looked like it had for too much of the season, underachieving and disappointing, and had me wondering just who the 2010 Cards really are. So by last night’s game, I needed a boost in my spirits. Unlike most Cardinals fans, I started my baseball life as a (sorry, but it’s true) Cubs fan. Friday night, I caught some of a Cubs game from 1987 that Comcast Chicago broadcast as a tribute to Andre Dawson’s Hall of Fame induction. That time period was my prime Cubs fandom, so watching those players – and especially hearing Harry Caray again – was like seeing old friends, bringing back a simpler time when watching baseball was just that: watching for the game itself, unencumbered by the constant presence of my laptop and Internet and Twitter and the other technological advances of the last 23 years. It also got me wondering what it would be like to just watch a game again. My game routine is so different now, as I’m so attached to Twitter throughout the course of a game. Could it be possible to voluntarily avoid it? More importantly, could it help relieve that malaise? The clincher to my decision came from Andre himself in his Hall of Fame induction speech when he said, “If you love this game, it will love you back.” I needed a way to recapture that 1987 baseball-watching love. But on the night of a Chris Carpenter start – which would mean foregoing an evening of connecting with all my fellow CC fans and missing all our discussions of the extreme close-ups the ESPN cameras surely would provide? Yes. Plus there would be no Jon Miller and Joe Morgan to complain about, since they were in Cooperstown. So, it was time to just enjoy the broadcast on its own. Other than those moments, though, I didn’t necessarily miss being disconnected for the game. Too, that could be because of the vast amount of information ESPN supplies. A huge change from watching the 1987 game is, of course, the on-screen graphics. Now we expect to have the score, outs, count and pitch speed constantly displayed. I like that ESPN displays the pitch count also, once it reaches 10 (and I didn’t know until last night they do that). Plus the amount of information and obscure statistics that ESPN has is staggering. 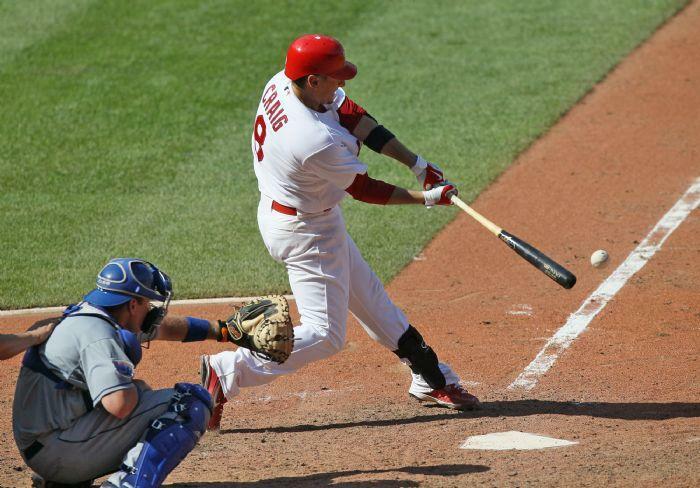 The Cards were 38-9 (now 39-9) when scoring first in the game, the best in the majors. Carp leads the National League with 12 strikeouts with a man on third base and less than two outs – just in case you were curious who did. And did you know the Cubs have spent 0 days above .500 this season? In addition, the analysis from Orel Hershiser was enlightening, such as his explanations at various times of Carp’s differing fastballs and types of breaking pitches. He even explained the annoying glove wiggle by Ryan Dempster, and demonstrated it in the booth with a glove. While I find the wiggle annoying, Hershiser’s explanation was good and made sense. The game was definitely action-filled. Although I briefly appreciated Marlon Byrd two weeks ago for his smart fielding during the All-Star Game, he annoyed me last night for his harsh treatment of Jon Jay in particular. And when he strode to the plate in the bottom of the 10th with the bases-loaded and Ryan Franklin in his second inning of work, all I could do was watch instead of share my fear that Byrd would be the hero right then. Not focusing on a computer screen did let me see the shot of a Cardinals fan kid standing next to a Cubs fan kid, with Cards Fan wiggling his fingers toward the field. Putting another curse on the Cubs? It worked, as Franklin got Byrd on a called third strike. And I loved that smile from Franklin as he walked off the field. As the ESPN camera showed Kyle McClellan warming up in the top of the 11th, I knew – courtesy of Cards MLB.com writer Matthew Leach on Twitter last Thursday – how poorly McClellan does in tie games. So I was worried anew. Yet Felipe Lopez came through, McClellan and Dennys Reyes got their jobs done, and the Cardinals had a hard-fought, first-place winner. As the Cards congratulated each other on the field, ESPN’s Dan Shulman described the game as a highly entertaining 11 innings. He was right. Perhaps I wouldn’t have thought so had the outcome gone the other way, but it was – as I’d been hoping – the opportunity I needed to simply enjoy the beauty of a baseball game. And in the end, the game’s outcome honored yesterday’s Hall of Fame inductees perfectly: Andre’s team losing, as they’d done so many times during his Cubs days, and Whitey Herzog’s team winning. Congratulations, of course, to Whitey on his well-deserved Hall of Fame induction also. He too had a wonderful quote, that being inducted “is like going to heaven before you die.” I appreciate Whitey and his success in his Cardinals’ years, even though I was an enemy fan at the time. (And I can’t go back and retroactively change my feelings about either the 1980s Cards or Cubs. I will always love June 23, 1984.) Whitey’s contributions were many, and I did enjoy reading the tweets yesterday afternoon from the long-time Cardinals fans as they were watching Whitey’s speech. After seeing a couple of botched double plays yesterday afternoon, and hearing one of our middle infielders dropped into trade talks made me wonder what this team has looked like with our various fielders in and out of the games. I’ll admit, this is a very small sample size. Fair enough. Moving on. This is still a small sample size. Let’s keep going. The numbers are getting bigger, and they are starting to paint a picture. For Schumaker and Ryan I looked at it a little differently. They both have started in just the one position (in the middle infield at least), and I was curious as to how they fare with and without each other. Let’s look at Skippy first. This absolutely blew my mind. Brendan Ryan in the lineup equates to 22 games over .500, and out of the lineup is 11 games under. I think the answer is simple. Put Brendan and Skip in the lineup and let them play. Just by observation (read: don’t yell at me for the next sentence – it’s my observation), it looks like Brendan and Skip have the easiest camaraderie on the field. I don’t know if it’s because they have played together more than any of the other pairings (although that would make sense) or if they just blend the best. Obviously they have both had their share of errors, miscues and otherwise ugly plays this year. The fact of the matter remains – Brendan and Skip in the lineup together has produced winning baseball. Wins and losses don’t lie. 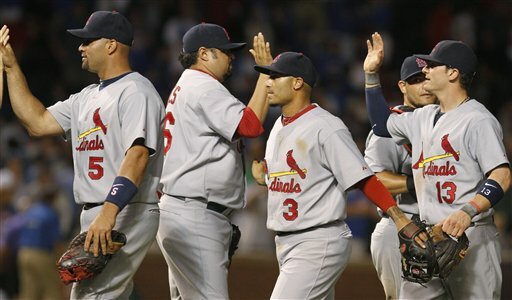 By winning number 8 in a row last night, the Cardinals exceeded a 7-game winning streak for the first time since 2006. Now they have the longest streak since another memorable year, 2004. And watching the team play over the last week reminds me a lot of that amazing 2004 team. They’re playing with confidence, they’re playing with energy – even when they’re trailing or tied, you know they’re going to come back and get it done. That’s the intriguing thing about winning streaks: you never know how long they will last or the ultimate impact they will have. And the end to a particular streak doesn’t necessarily mean the rollercoaster is headed back down. Look at the White Sox. Before the All-Star break, they won 25 of 30 games (including winning streaks of 11 and 8 games each) and propelled themselves from 9 1/2 games back and third place on June 9 to first place by a half-game on July 11. Since the break, the Sox are 3-4 but have built their lead to 2 1/2 games. In addition to the Cardinals’ ongoing streak, they have won 9 of their last 10 games and, in doing so, beaten three of the “charter members of the Cardinals Killer club” in the process: Bud Norris on July 9, Kyle Kendrick on Monday and now Joe Blanton last night. So things have definitely turned around! The Cardinals’ eight wins have come in a variety of ways, with a variety of heroes, as Angela detailed in yesterday’s photos of the week. Last night was another strong pitching performance, as Jaime Garcia was outstanding in his 7 innings and allowed only 1 run on 4 hits (with the run coming on a homer to Ryan Howard). Perhaps best of all, Jaime threw only 95 pitches to go those 7 innings. 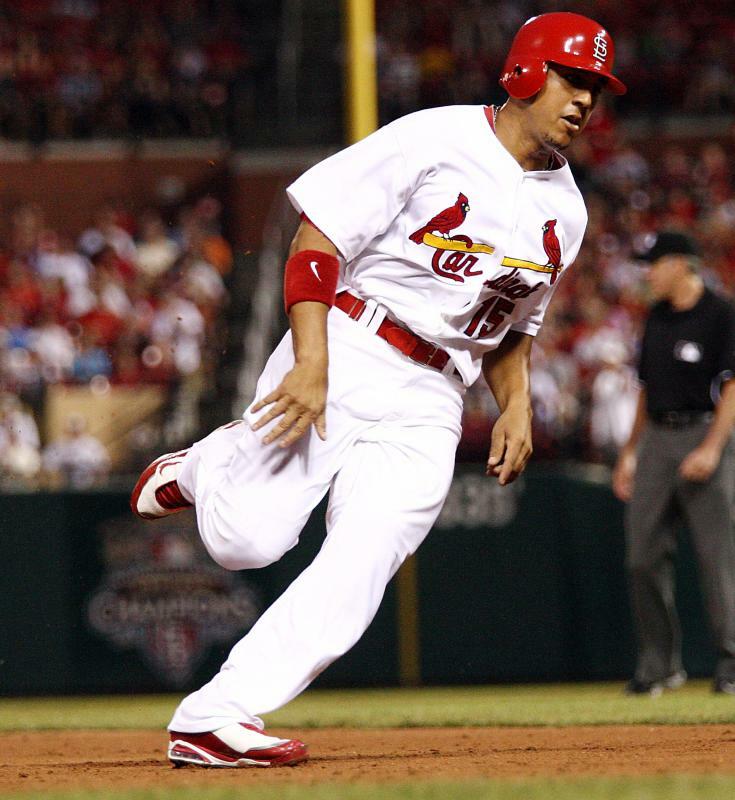 Offensively, Albert gave the Cards a short-lived 1-0 lead when he drove in Wonder Boy Jon Jay (pictured above, and he went 2 for 3 last night with a sacrifice bunt). 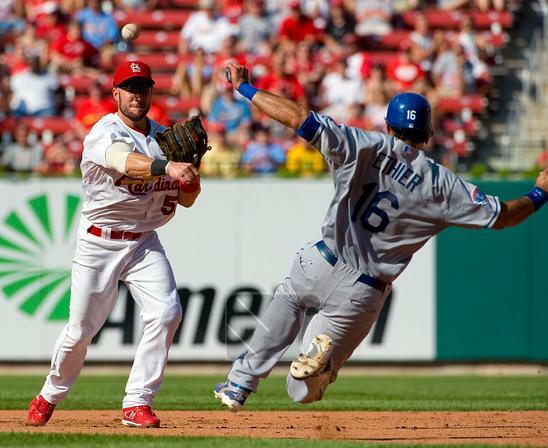 Hunky Matt Holliday continued his homer tear to put the Cards up 2-1 in the 7th – giving Jaime the well-deserved victory. In the 8th, the Cardinals added three more runs thanks to Everyone’s Nemesis Aaron Miles, Brendan (with help with a Phillies error), Felipe Lopez and Colby Rasmus. Even Ryan Franklin had the opportunity to bat that inning, since he came in to get the final out in the top of the 8th. Not that Franklin actually did anything with the bat, however – like even swing it at all. But he stood there to get the third out before heading back out to pitch his way to save number 18.
Who knows how high up the ceiling is for the Cardinals this season? Thankfully, that’s still to be decided so we can just appreciate the games and enjoy the ride. 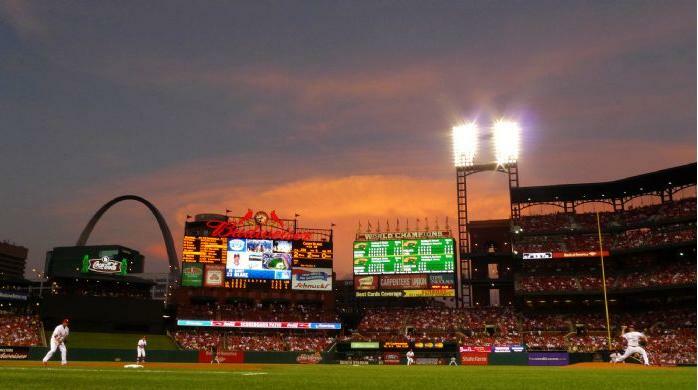 And we don’t have long to find out how if they can sweep the entire homestand: game four against the Phillies is this afternoon at 1:15 p.m. Central time, with Adam Wainwright going for his second win of the streak. 7 wins in a row. Beautiful feeling, isn’t it? We’re switching things up here on Cardinal Diamond Dairies and moving our photo day to Wednesday. Today instead of just random pictures I’m trying something out – a photo from each day of the 7 game streak (plus a bonus shot – you’ll see)! Hope you enjoy it! 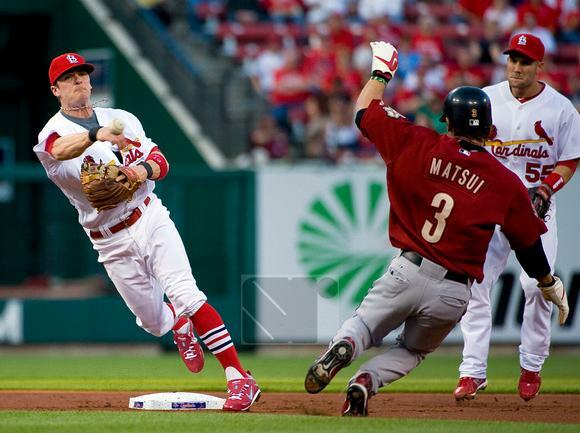 Matt Holliday provided almost all of the offense with this 3 run blast the day before the All-Star break began. I don’t know how to point out the packet of sunflower seeds in his pocket that made me laugh without sounding like a #chickcomment… so there you go. 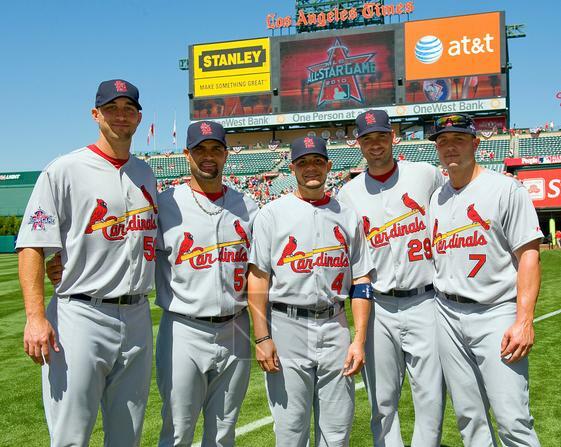 I couldn’t help but put in a shot of the Cards’ All-Stars together at the game in Anaheim. Hey, our team won that night too, so it fits! The Cardinals jumped right back in after the break, putting up seven runs against Clayton Kershaw and the Dodgers, who had been very effective against the Cards… until this night. 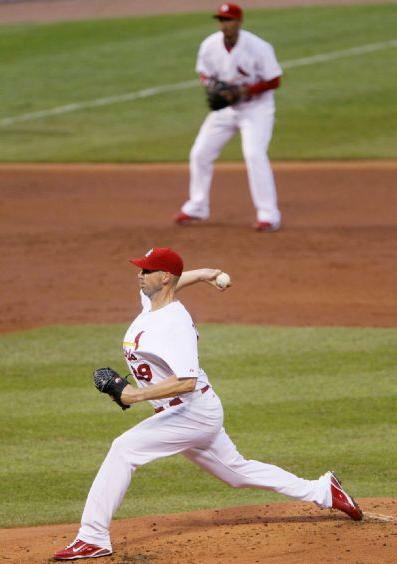 After a day in which we were treated to no baseball at all, it was nice to be back seeing scenes like this one of Chris Carpenter pitching in the fifth inning. 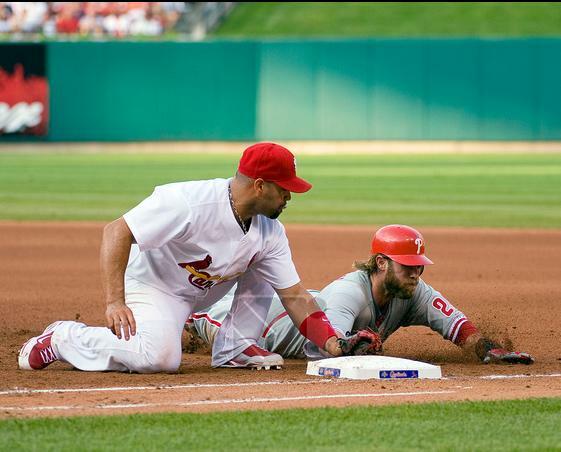 You can’t help but enjoy a game that features runs and flashy defensive plays like this one Albert Pujols made from the seat of his pants! Two games after the break we were seeing what looked like a team that was putting things together. Solid pitching, scoring runs in bunches and defense? We love it! The Cards were rather rude hosts to the Dodgers, running them out of town with ninth inning heroics on Joe Torre’s 70th birthday no less! Allen Craig didn’t care about Torre. He had his own 26th birthday to worry about, and he did it in style, making the hit to tie the game in the ninth inning and set up Matt Holliday for the game winning hit in the next at-bat! After a couple less than Carp-like starts towards the end of the first half, Carpenter has been a rockstar since the break, throwing 62 strikes over 90 pitches in eight dominant innings last night against the Phillies. 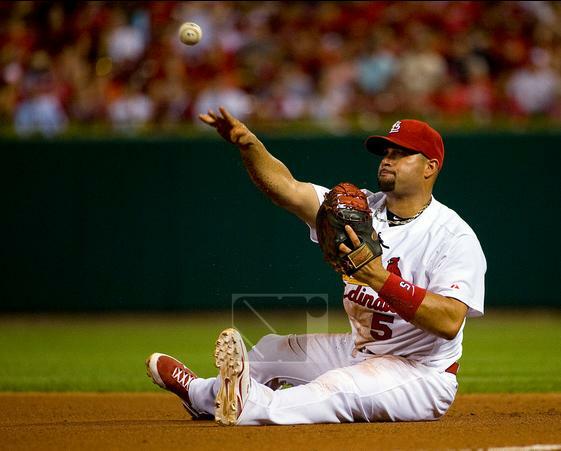 Randy Winn kicked off the fireworks in the third inning with his second home run in as many days, and Matt Holliday put the game away for good with his three run blast in the fifth that put the Cards up 6-0.